Churches Together In Todmorden is hosting a General Election hustings for people to come and ask questions of candidates tonight (April 16). It being being held at Todmorden Town Hall, starting at 7.30pm. It is open for all to attend if they wish, to see candidates answer questions in the run up to the General Election on May 7. A spokesperson for Churches Together in Todmorden said all the election candidates for the Calder Valley constituency have been invited and those who have accepted the invitation and will be attending are: Alisdair McGregor (Liberal Democrat); Josh Fenton-Glynn (Labour); Paul Graham Rogan (Ukip); Craig Whitaker (Conservative) and Jenny Shepherd (Green Party). At the time of writing, the orgainsers were still waiting to hear from from Rod Sutcliffe (A Voice For The Region) and Joe Stead (World Peace Through Song). The meeting will be chaired by the Vicar of Todmorden, Canon Owen Page. 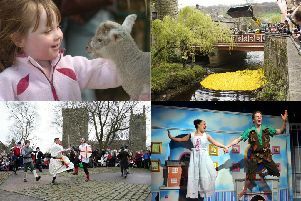 It has been organised by Churches Together in Todmorden and the event has been supported by Todmorden Town Council. The meeting will follow a similar format the television politics show Question Time. “There will be a ‘Question Time’ style debate with each candidate given a few minutes to introduce themselves and put forward their policies,” said the spokesperson. Previously candidates have spoken at a well-attended education inspired meeting at Calder High School, where the school’s head girl also joined the panel.